Every Sunday Morning, combining live music and food in a fresh, cultural environment, City Winery’s Klezmer brunch series pairs some of the greatest musicians in the world with delicious lox, bagels and other tasty fare on Sunday mornings from 11am to 2pm. City Winery's brunch on Jan 1, 2017 features Paul Shapiro's Ribs & Brisket Revue, with special guest Frank London. The most controversial Yiddish play of all time by one of the greatest Yiddish writers has its first New York revival in over 70 years. In Yiddish with English supertitles. Ring in the New Year with NYTF's Light Up The Night! An unforgettable concert showcasing incredible singers and a 16-piece orchestra performing rediscovered and restored music from the theatrical works of the great composers of the Golden Age of Yiddish Theatre including Goldfaden, Olshanetsky, Ellstein and Rumshinsky, who composed NYTF's critically acclaimed operetta The Golden Bride. Conducted by Zalmen Mlotek. With English supertitles. and joined by performers Grace Field and Daniel Greenwood. Introducing Samuel Levit and Sophia Levit. 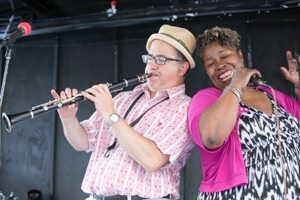 Every Sunday Morning, combining live music and food in a fresh, cultural environment, City Winery’s Klezmer brunch series pairs some of the greatest musicians in the world with delicious lox, bagels and other tasty fare on Sunday mornings from 11am to 2pm. 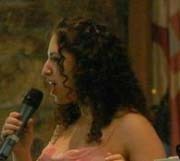 City Winery's brunch on Jan 8, 2017 features Metropolitan Klezmer & Isle of Klezbos. Alicia Svigal's original score to the 1918 silent film classic, "the Yellow Ticket," starring Pola Negri, with live score performed live by Alicia Svigals, violin/vocals; Marilyn Lerner, piano; Special guest Laura DeLuca (of the Seattle Symphony), clarinet. 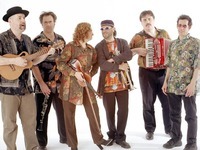 A unique collaboration between a new york-based klezmer band Litvakus (originally from Belarus) and a Berlin-based singer Sasha Lurje, who is well-known in Mtl due to her association with Klezkanada. 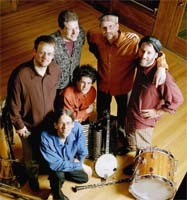 Goyfriend (druG-Goy) is a new program featuring one of the most sought after voices in klezmer music and critically acclaimed Litvakus, a band known for its raw, "rootsy" and energetic performance of Jewish music.This program offers for the first time to western audiences a chance not only to hear rare northern European Jewish music, but more importantly the context in which that music was created. 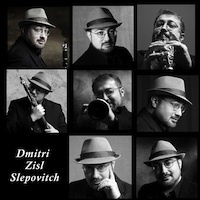 The brainchild of Latvian native, Lurje and Belarussian Zisl Slepovitch - Litvakus’ bandleader, and an accomplished composer, clarinetist and ethno-musicologist, and is based on their extensive research and field recordings in their native countries and the surrounding area. Comedienne in a Hasid's Pants: Pepi Littman, presented by Jeanette Lewicki, with Laura Rosenberg and Josh Laurenzi. Every Sunday Morning, combining live music and food in a fresh, cultural environment, City Winery’s Klezmer brunch series pairs some of the greatest musicians in the world with delicious lox, bagels and other tasty fare on Sunday mornings from 11am to 2pm. City Winery's brunch on Oct 2, 2016 features the Manny Blanc Project. The fear of the other is a primal biological instinct. The other is scary. The other is naturally perceived as a threat. Authors and directors exploit that fear in movies about the extraterrestrial aliens. The chauvinist politicians "divide and conquer" by picturing migrants and refugees in the eyes of their electorate as that scary Other (how topical it is today!). By launching the program GoyFriend -- the Jew in the Eyes of the Other - together with my colleagues - Sasha Lurje and Litvakus we're digging out those ancient fears from the Baltic and Slavic folklore. We want to place them in the bright daylight and examine, and also see attempts to near, understand, reflect and sometimes accept the Other in one's own narrative. The event is co-presented by Ashkenaz and the Schwartz/Reisman Centre, and is sponsored by JCC Association’s Making Music Happen Centennial Grant Initiative, funded by a grant from Marvin J. Pertzik and the Mary Livingston Griggs and Mary Griggs Burke Foundation. Holzman and Terry Stokes will share stories by Isaac Bashevis Singer, the "Elders of Chelm", and honored rabbis. 3:30pm, Anthony Mordechai Tzvi Russell, in concert. Tickets: $10 storytelling only / $18 storytelling + concert / no charge students 18 and under. From traditional to classical to jazz/rock/fusion, the repertoire of the Shirim Klezmer Orchestra mirrors the diversity of the offerings of WCMS. The concert will feature music from their many studio recordings, plus musical highlights from the thousands of concerts, parties, and events they have played. 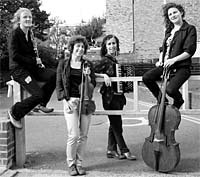 Hear traditional tunes from the rich tradition of Eastern European Jewish Music; classical/klezmer crossover arrangements of pieces by Tchaikovsky and others; plus original compositions which have been performed and recorded by many other bands. Come help us celebrate the 35th anniversaries of both the Shirim Klezmer Orchestra and Winchester Community Music School. Free admission. Join us for a pre-concert reception at 2:30 pm. 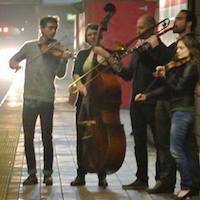 Play klezmer and dance! Bring along an instrument and/or your dancing feet.